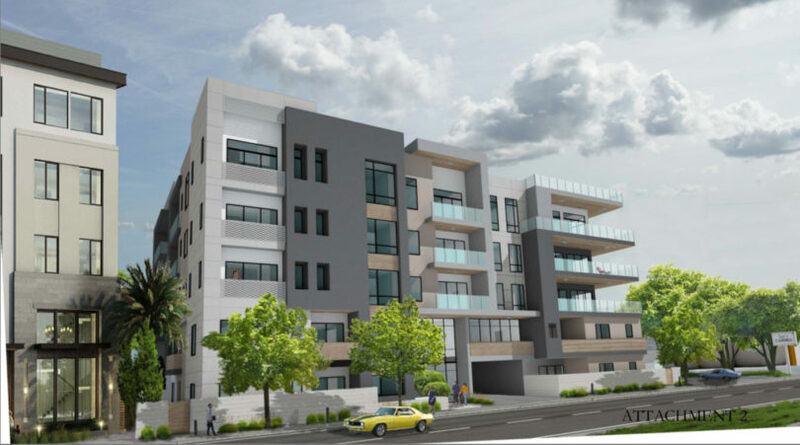 [UPDATE 1/26/18] Luxone LLC — the owner of the Mohr Clocks 3/4 acre parcel in the El Camino throroughfare zone — has created two concepts for a 5 story condominium building, 4846 El Camino. 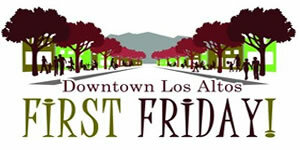 These will be presented on Jan. 16 to a joint study session of the Planning Commission and City Council. 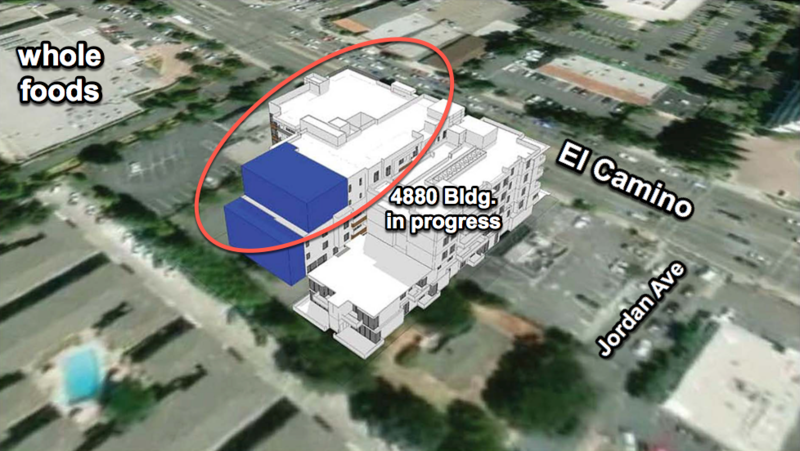 One concept for this new 4846 El Camino project has 38 units, 5 BMR units, and 79 parking stalls. A second concept has 49 units ( achieved via fewer 3 bedroom units , and more 1 – 2 bedroom units), 8 BMR units and 83 parking stalls. Both concepts ask for a waiver for a 15 foot elevator tower to the roof deck. The 49 unit 4846 El Camino concept also asks for a waiver of 7 parking stalls. Although both concept for 4846 El Camino are equally tall, the 49 unit concept necessarily has some what more mass and shorter setbacks from the rear than the 38 unit concept. Lalahpolitico: Neighbors to the rear of the project will clearly hate both 4846 El Camino concepts. Will they hate the 49 unit concept more because of its shorter setbacks? 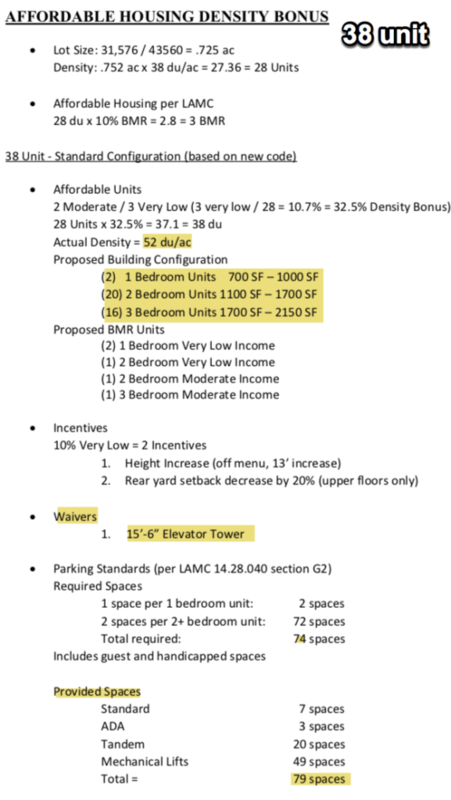 Will the City Council like the 49 unit concept more because of the extra BMR units? And the staff report seems to imply that the 49 unit concept should throw off more BMR units than just 8 in the current version of that concept. Hmmmm? Where is the supporting density bonus “math” for greater than 8 units? [UPDATE 1/26/18] At the Jan. 16 meeting, only two council members – Mordo and Bruins – seemed to be ok with the 49 unit concept with all its larger rear setback waivers. No one preferred the 38 unit concept which also asked for somewhat smaller rear yard setback waivers. The other 3 council members – Prochow, Pepper, Eng – liked the 49 units, but were not comfortable with the setbacks. Both the 38 unit and 49 unit concepts are fully parked with complex tandem mechanical lifts. Bruins was concerned about “too many curb cuts” on El Camino creating congestion. Bruins suggested that Luxone negotiate to lease parking stalls from Whole Foods which is nearly next door. She also suggested Luxone work out a easement with Sees Candy next door to create a shared driveway. Bruins stated that the 39 unit concept provided 13% BMRs and that the 49 unit concept provided 16% BMRs. Everyone seemed pleased with the reduction in number of 3 bedroom units and the increase in the number of 1 and 2 bedroom units in the 49 unit concept. Pepper wished the 3 bedroom units could be reduced even more. 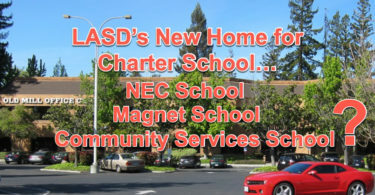 It was unclear whether our local version of the State Density Bonus law meant the proposed concepts qualified for the rear setback waivers it was asking for. Mordo asserted, “If the extra setback is a developer waiver/incentive that is not on our “local menu,” then the City has to to prove that what Luxone asking for..that they don’t need it [to make the project feasible.] Others said that the local ordinance exlcudes using the same menu item more than once. In this case, the menu offers a 20% reduction in rear setback, but the request seemed to be for more like a 40% reduction in rear setback. Double-dipping may be a no-no. There were no definitive answers; this was a study session…just for studying, not for deciding. 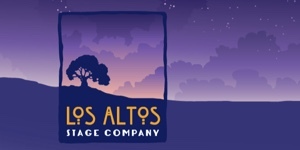 Lalahpolitico: With only 2 of 5 council members broadly supportive, and no planning members enthusiastic, the developer of this project will be rethinking strategy. They were trying to play nice. ORGINAL POST…Let’s take a look at highlights of the staff report. Birds eye view from SE. Circle is the new project. 4880 is under construction now but is litle beyond the foundation stage. So it is modeled here by the Luxone architect. I think the red cubes vs. the blue cubes are trying to show how the two concept compare with each other in mass…but also how they compare to the neighbor’s 4880 rear set backs. We all await a clarifying “walkthough” of these images at the Jan. 16 meeting. 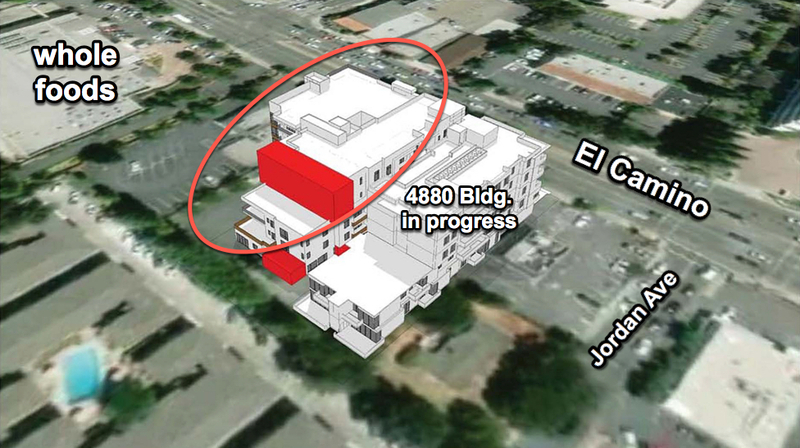 The architect provided 3 other vantage points for the above bird’s eye view of 4846 El Camino in his submission. But Lalahpolitico chose just to use this one from the SE position because it focuses on the REAR SETBACKs most clearly. Those are the most contentious in my opinion. Lalahpolitico has highlighted and circled what I think are the key things that are the SAME or DIFFER. 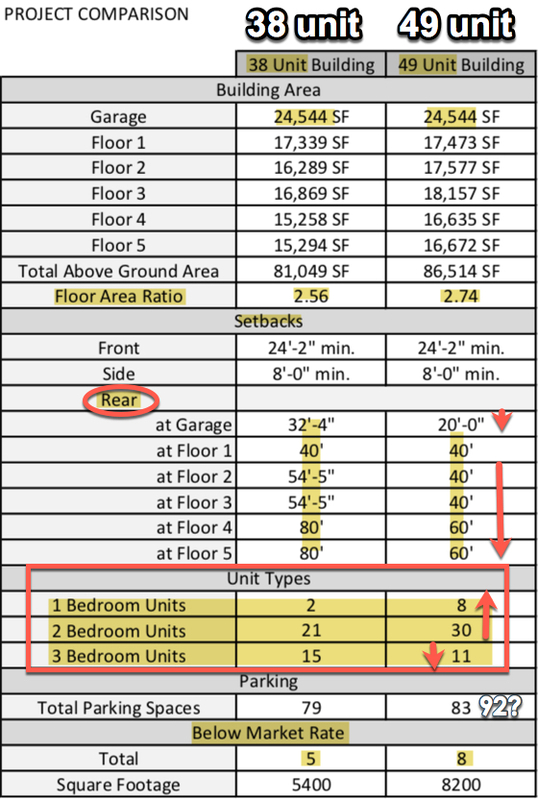 Notice that the size of the garage floor is the same in both concepts. (There is one of those mechanical lifts again.) So of course the 49 unit 4846 El Camino concept is a bit underparked – Luxone is asking for a -7 stall waiver. Notice how the 49 unit concept has more one and two bedroom units, and fewer 3 bedroom units. Check out the reduced rear setbacks of the the 49 unit concept- at upper floors 60 rather than 80 feet, at lower floors 40 feet rather than ~55 feet. Lalahpolitico: This parking info from the staff report confused me. The parking requirements on this section vs. those provided vs. in summary table above are not consistent, don’t add up. 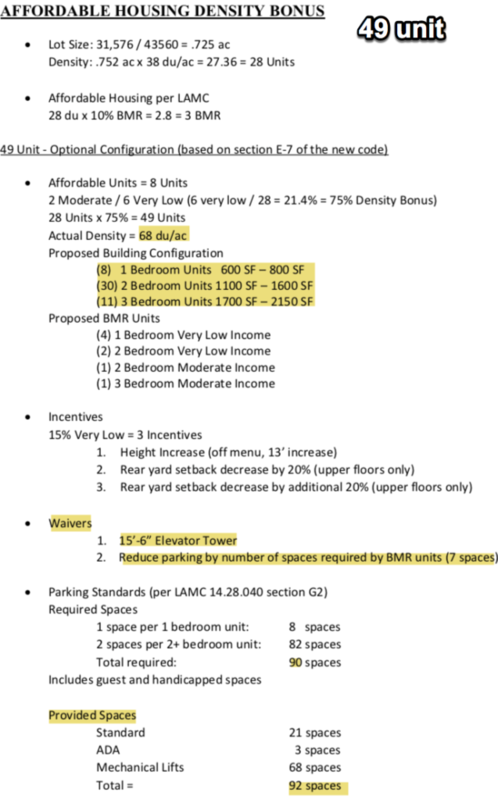 Please explain the 7 stall waiver indicated above for the 49 unit 4846 El Camino concept ? I am hoping this will be clarified by Luxone or staff at the meeting Jan. 16, 2018. You will notice in the above… that the one and two bedrooms units are a wee bit smaller in this 4846 El Camino 49 unit concept (100 sq feet) than in the 38 unit concept. Let me reiterate that the key difference between the two concepts is that in the 49 unit concept the quantity of 3 bedroom units are reduced quite a bit, and the quantity of 1 and 2 bedroom units are increased quite a bit. The size of units varies somewhat. 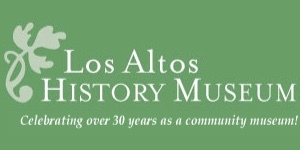 The full Los Altos staff Jan. 16 study session report and all the Luxone images are here. 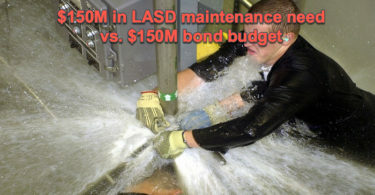 Is LASD neglecting needed repairs on 9 schools?